The Chocolate Muffin Tree: Sensational Self Portraits!!!! 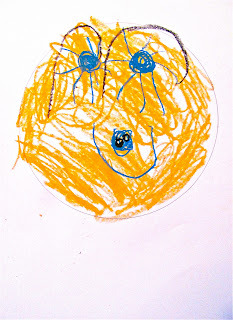 I did not even plan to do this with my daughter, but Maggy from Red Ted Art's Blog just did a post with her son about self portraits and that inspired me! She said she was entering it in the Portrait Exhibition that Lilla a Blog is having, so I checked that out that too, and it got me excited to try a self portrait with Cassie and possibly enter it too! She did one drawing with Crayola Oil Pastels and a second drawing with oil pastel and collage elements. In the exhibition Lilla a wants it to be more of a collage so that is why we did the second one in collage! They both turned out Great and I encourage all of you with little ones to try a self portrait with them too! My daughter was very excited to create these! Cassie is SO PROUD OF THEM! Go to Lilla a to see the Portrait Exhibition!!! 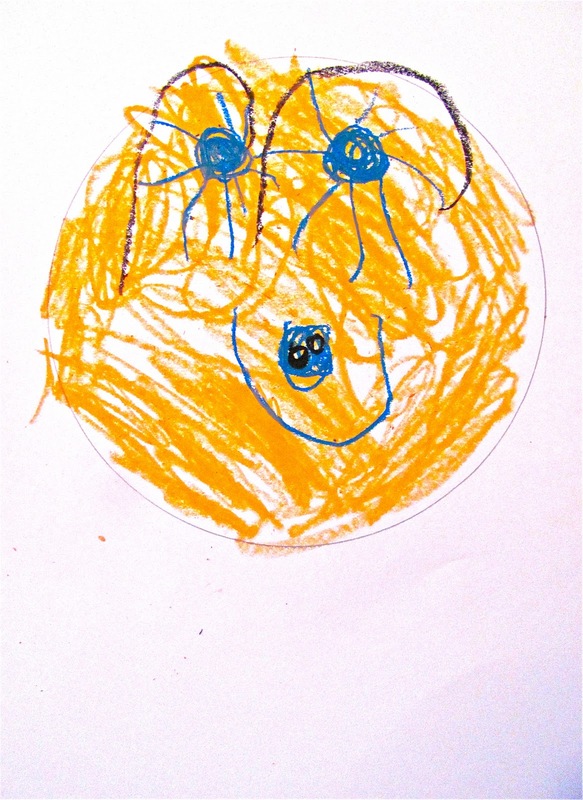 I wanted the self portrait to be large and to have room to fit her eyes, nose, mouth, and other features so we used a small plate to trace a circle. For the exhibition we used a large paper plate. What shape is a face? A circle and oval is what my daughter answered! Next, we colored the skin color of the face. Cassie loved the oil pastels! They look great to overlap colors! Then we added eyes. I told her to look at her face in a mirror to see the color of her eyes, eyelashes, eyebrows, and even the pupils! I asked my daughter what else do you see? She said her nose and then wanted to use two small black buttons for nostril holes for the exhibition collage. Also, she added a mouth with oil pastel. Not a red mouth here! Four year olds are hard to convince and may say their mouth is pink and will still make it blue! On her exhibition collage she added red lips! Four year olds definitely have a mind of their own!!!! Look how hard this girl works! Lastly, we added curly red hair. For the collage, the hair was added first with yarn! Cassie loved that! 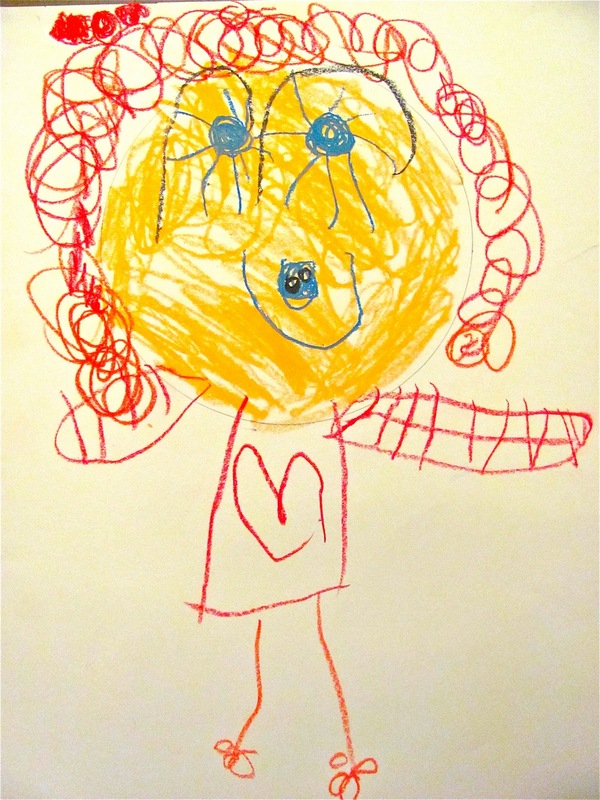 Cassie really had a fun time and wanted to keep making these self portraits! Cassie's finished oil pastel self portrait! Cassie's collage self-portrait for the exhibition! ***Notice the added buttons and glittery gold necklace for the finishing touch!!! Have fun making a self-portrait with your little ones!!! Wow what a gorgeous portrait! I love Cassie's bright blue eyes eyelashes! Such a precious keepsake. Oh my oh my oh my! I LOVE your self portaits!! They are BRILLIANT!! 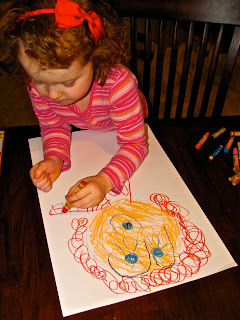 The hair is simply gorgeous, as is the oil pastel. Wow, isn't she a clever clever girl! Am chuffed to bits that our self portrait inspired this fabulous post! Thank you so so much for linking up and sharing it with us!! These portraits are gorgeous - and what a treasure to keep to record how she saw herself at this age. We really like collages too - I like the extra dimensions they give. Thanks for sharing this with us at the Play Academy. That is so precious. You have such cute ideas on your blog. Thanks for linking up with Fun for Kids Friday! This is so cute! I have a three year old daughter and love your ideas! I am a new follower! This is a fun project. I teach a pre-school art program during the summer. I love your ideas. She is quite an artist. I love doing crafts with my 4 yr old all the time. Very adorable! It turned out so well! Melissa, you made it look so simple. I am gonna try this! This is amazing! I'm so excited to try this with my kids now. It looks like so much fun! Thank you all for all the compliments! I hope all of you have fun doing portraits with your little ones! I love this idea! These turned out so great!! Your daughter seems to have been very engaged, and inspired by the materials. Just lovely! I LOVE this! 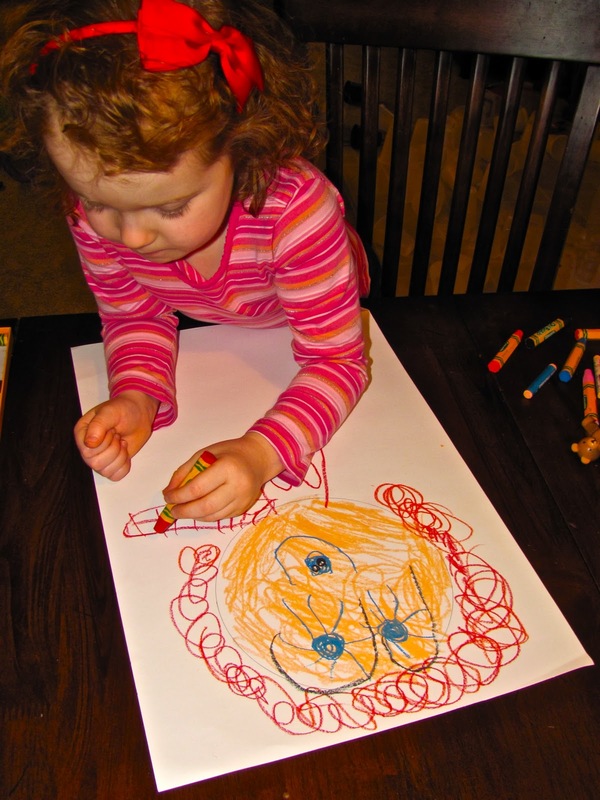 My daughter has been really into portraiture lately, too. So much fun! This is fantastic. Your daughter did such a great job! How fun! What a wonderful keepsake too! very nice, love the project, now I'm inspired too! thanks so much for sharing on Craft schooling Sunday! I can see this one being adapted for older children using different materials! Great prompt - thank you!